As a botanist and professor of plant ecology, Robin Wall Kimmerer has spent a career learning how to ask questions of nature using the tools of science. As a Potawatomi woman, she learned from elders, family, and history that the Potawatomi, as well as a majority of other cultures indigenous to this land, consider plants and animals to be our oldest teachers. 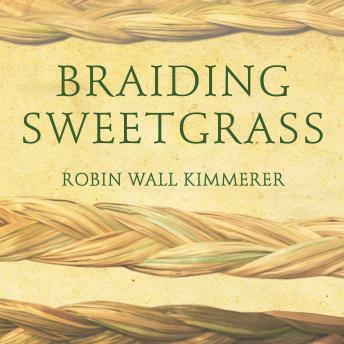 In Braiding Sweetgrass, Kimmerer brings these two lenses of knowing together to reveal what it means to see humans as 'the younger brothers of creation.' As she explores these themes, she circles toward a central argument: The awakening of a wider ecological consciousness requires the acknowledgement and celebration of our reciprocal relationship with the world. Once we begin to listen for the languages of other beings, we can begin to understand the innumerable life-giving gifts the world provides us and learn to offer our thanks, our care, and our own gifts in return.